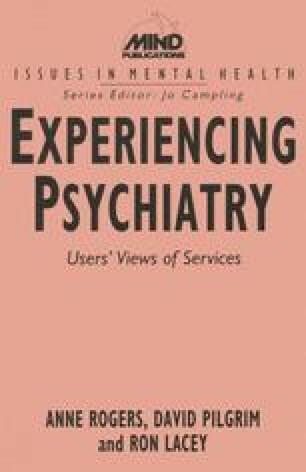 At the beginning of the book we discussed the difficulties which both professionals and researchers had found in taking the views of psychiatric patients seriously. We hope that we have broken free of these previous prejudices and set out the case for listening to the user’s voice. In addition, in engaging with the data seriously, we have learned a number of lessons about the sociology of the psychiatric patient’s view of mental health and a user-friendly social policy. These lessons will be discussed in this final chapter.